The altered is a very common scale in the jazz style. Since it (as its name applies) contains many alteration it of used to create colour and supplies a great structure for colourful chords which we'll learn to build once we're familiar with the scale. As you can see the scale is built out of seven notes that contain all the lowered notes in relationship with the major scale. Accept from the root note all the notes of the major scale have been lowered. An easy way to remember this scale is by raising the root note of a major scale in half a tone. So in order to play C altered we would play B major then raise the root note. You can look at it also in another way. 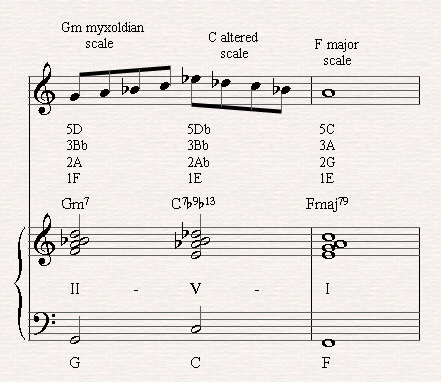 Understand that this scale is actually a melodic minor scale starting from the seventh degree. C altered is actually a C# melodic minor starting from the seventh degree. The altered scale is often being played in jazz. It is often used to be played when a seventh chord is played in the left. The reason this occurs is because the scale contains the major third and the lowered seventh note in relationship with the root note of the scale. In II-V-I progressions we will often use this jazz scale in the dominant as long as it is played with the correct alterations. 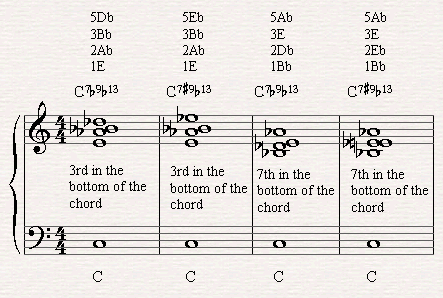 Let's have a look first at the possible Seventh chords we can create in C altered for example. These are the common possibilities we can use in II-V-I examples. The next II-V-I chord progression allows us to use the altered scale in the dominant since it is altered with a lowered 9th and or 13th. Click here to read about adding or lowering the 9th, 11th and/or 13th to jazz piano chords. 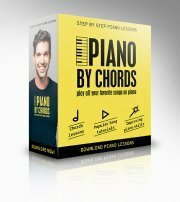 Here's a free piano chord chart of all 12 altered scales.